When it comes to painting white, I have two completely different methods for doing it. It's all based off how much white is on the model overall. Of the two, I use the one that works best for what I'm painting in order to make the process as smooth as possible. I'm going to show you the two ways I paint white along with how I chose my method and some examples of each one. The first thing when deciding which method I'm going to use to paint white is to determine just how much of the model is going to be white in the end. I don't have a specific percentage, but if the majority of the model is going to be white then I'll use my first method. 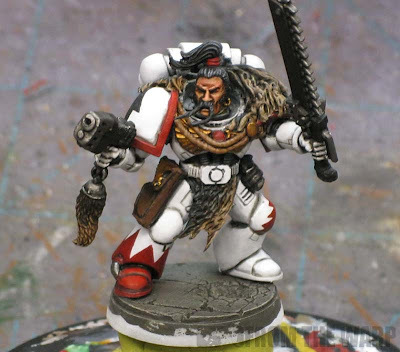 A White Scar space marine is a perfect example. The majority of this guy is going to be white. If it's only a spot color or a smaller portion of the model that is going to be white, I'll use my second method. A good example here would be the helmet or shoulderpad of a terminator. But what if my model is half white and half dark? You know, like in a quartered or split color scheme. This one is easy as well. Use the first method below and prime your model white. Work your darker colors over the white after you've shaded it You'll just need to be careful, but you knew that already since you're tackling a split paint scheme to begin with. What if I don't have any white, it's just white freehand work? In this case, I use a light grey color as my base and then finish that off with white as needed to give it some variety. When it comes to freehand, there are bigger things you need to worry about like when you do it more than the color white. I still wouldn't do the million layers of thinned white and build up to it. Go right for the light grey color (especially if you're working over a dark color) and then go to white for the finishing touches. Believe it or not, this one is the easier one of the two despite there being more white on the completed model. I've already outlined the process in its entirely in this post on painting White Scar marines. It comes down to priming the model white and adding a specific wash for the shading. The beauty of this method is that it is very fast and very easy to do and will give you a great results with a little bit of clean up work in the end. By the time you add your additional details and such like weathering, the model really comes to life. Using this method, you could put a White Scars or Pre-Heresy World Eaters army on the table in no time at all. Any marine army with predominantly white armour becomes super easy to do. The second method: Only a small portion of the model is white. This is the method I use when only a small portion of the model is going to be white. The process involves a series of layers to build up a white finish. Since I'll most likely be working over black primer (remember the majority of the model is dark), I'll need to build up to white. There's no point in trying to use a zillion coats of thinned white as the only thing you'll most likely end up with is a spotchy, uneven, obscured model along with a permanent cramp in your hand and lower back from painting for so long. I start with a dark grey color (GW Mechanicus Standard Grey would work here). Over that, I apply a lighter color grey (GW Administratum Grey Would work here) leaving the darker grey showing in the deepest recesses only. The final layer is white and that can be either layered over the previous one covering it completely or blended using a wet blending approach for additional shading. The wet blending is not needed, it just makes for a nice touch. 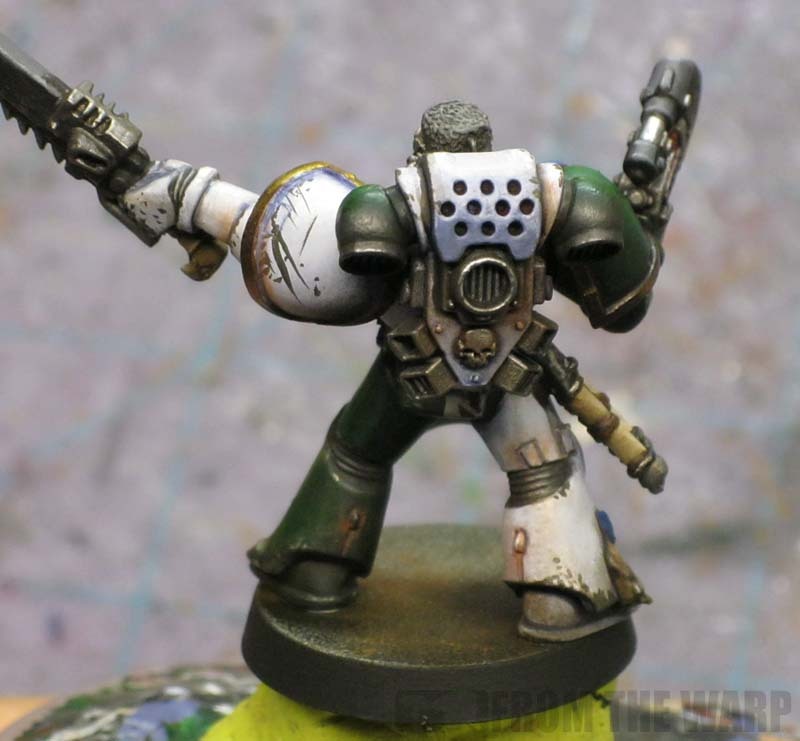 Here are few pointers on wet blending for those looking to try it out. And by that, I mean the color you use. 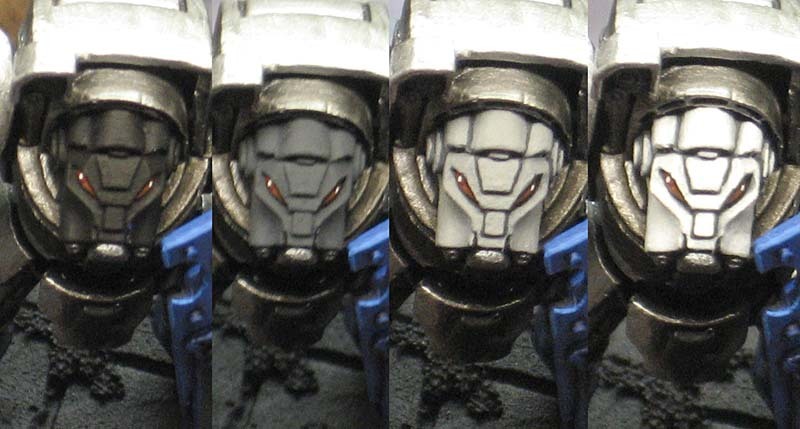 When it comes to the second method, if you prime with a light grey color instead of black, you can still get your dark model overall, and it cuts out a step when it comes to painting the small white areas. As a side note, I use cheap primer for my models as I'm convinced it's how you prime that matters more than what you actually use. 2. Assemble then paint or paint then assemble. These two methods are based on my process of building my model in it's entirety and then painting it. If you paint your model in sub-assemblies and then put the pieces together in the end, you can use the first method in some case as you'll be able to prime those particular pieces white as needed. 3. Varying the techniques is a good thing for results. When it comes to the second method and layering up the greys to get to white, you can use cool greys or warm greys to give the model different looks. It comes down to personal preference in the end. Hopefully this post shows you that white is not a super hard color to paint. It's not impossible to have a great looking white armoured force if you're willing to try a new technique or two. Believe me, I used to think white was an impossible color to paint as well. I am currently painting a Fantasy Empire army with quartered white and green. The hardest part for me is shading to keep the white from looking so flat. The new GW base color Ceramite White is amazing, getting great coverage over black primer in as little as two coats. I used to build up from gray also until I tried this paint. Thanks Ron! I'm working on a Tau army now that is going to be majority white. I'm using your white scars post as a guide, and it has been a less painful process than I expected. I even bought some soft body black wash from secret weapon miniatures, and it has been great to work with it. 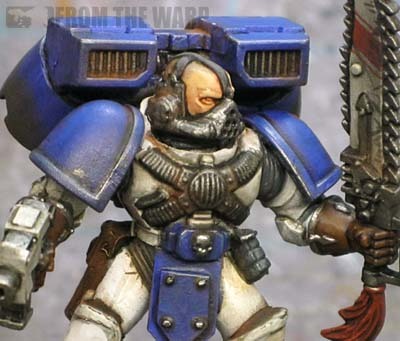 This post gives a lot of background to the White Scar model post. It's like you read my mind Ron. I'm about to paint a white helmet on a dark marine and this will be very useful. I've just done my first white figure - an Apocathery for my Blood Ravens - and i was really edgy about it just because by reputation its a hard colour to paint. I did him off-white (slightly blue, actually) then washed into the recesses and highlighted with "pure" white, and he turned out pretty well. I think the biggest fear i had is that a missed paintstroke on some of the other areas (say, shoulders or weapons) onto the white would be a nightmare to clean up! This may be answering my own question, but my SM Force is Yellow/White. The white areas are the chest piece, and left arm&shoulder pad, as wells as half the helmet (all but the face-mask part) and the top part of the Power Pack. Should I use the split-colour method, or the start from black method? In your opinion. I use a modified Ron/Heavy metal white, I prime with a grey primer, use ulathan grey base coat, then a secret weapon soft black body wash in the recesses, then clean up with ulathan grey again, followed by a white edge highlight. The grey is light enough to appear as white. Hey narric if I was you I'd get a yellow primer from army painter as the majority of your dudes are yellow then build the white up either from bleached bone or grey.OR get a bone colour primer from army painter as the white will go over it nicely and use the yellow glaze rather than the paintand you'll get an awesome looking yellow too. In my opinion buddy yellow is just as much a pig to paint as white. Hey sorry for butting in Ron. what do you think. ctreleheb: Glad to hear you're getting good results with the new colors. BoxerSaint: Perfect. White doesn't have to be the hard color everyone assumes it's going to be. rob82: This is the exact method I use to do that very thing on my Marines. Matt Farr: I know what you mean. One stray mark and you go from painting to frantically trying to clean off your model before it's scarred. Narric: I'd go all white prime and shade the white areas first. Then go in and add your yellow parts to the model. Working the yellow over a white base will make it much easier. EllisW: Very nice. Sometimes I'll leave the model a light grey as well and use pure white to edge highlight. Like you said, leave it a light enough grey and it will appear white to the viewer. james: I'd go white primer on the whole model. I'm going to try painting a yellow model here in the future and will share my results. Yellow is not a tough color either really. Ron, I've a question concerning ironicly white!! LOL, I'm in the process of moving my paints from pots to droppers. While I was doing this i did my normal thing 20 drops of water 20 drops of flow aid/ retarder mix, I added this to a NEW pot of Ceremite white base, it proceeded to.... for a lack of a better term curdle like milk would if you added lemon juice to it!!! It now is as thick as kids oster paste!!! Only has happened to this color, no issues with other paints or base paints. Have you ever heard of this, or had it happen to you?? I'll have to do it on my next set of Marines & terminators that need painting. EllisW: Yikes! Never heard of this before. I don't add anything to my paints other than a bit of water on my brush as I use them. That's odd though that it would act like that. Narris: Let me know how it goes. Once I get some time, I'm going to try a few methods for yellow myself. rob82: Looks good! And yes, the more you practice it, the faster and cleaner you'll get at doing it.